Scalp cooling as a method to reduce the incidence of chemotherapy-induced alopecia (CIA) is increasingly used in daily practice worldwide. However, in patients treated with 5-fluorouracil, epirubicin and cyclophosphamide (FEC), scalp cooling fails in 48–67% of patients. This study investigated the efficacy of extended duration of post-infusion scalp cooling in breast cancer patients treated with this regimen. In this prospective multi-centre randomised study, 102 patients with early breast cancer treated with adjuvant FEC chemotherapy were randomly assigned in a 1:1 ratio to a post-infusion cooling time of 90 or 150 min. The primary endpoint was the need to wear a wig or other head covering to mask visible hair loss. Sixteen out of 48 patients (33%) treated with 90 min of post-infusion cooling did not need any head covering, compared with 21 out of 46 patients (45%) treated with 150 min of post-infusion cooling (p = 0.2). WHO grades 2–3 (moderate-complete) alopecia were reported more often in patients treated with 90-min post-infusion cooling time (n = 25/51 (49%) versus n = 17/51 (33%); p = 0,02). Scalp cooling was well-tolerated (mean Visual Analogue Score 7.4) and only three patients (3%) stopped due to intolerance during treatment. Extending the duration of 90-min post-infusion scalp cooling to 150 min in patients treated with adjuvant FEC chemotherapy was well-tolerated but did not significantly diminish the need for head covering. However, grades 2–3 alopecia was seen less often with prolonged post-infusion scalp cooling. The authors thank all the patients who participated in our study. Furthermore, we thank all the investigators of the participating hospitals: Dr. Valster, Lievensberg Ziekenhuis, Dr. Van Groeningen, Amstelland ziekenhuis, Dr. de Klerk, Waterlandziekenhuis, Dr. Pruijt, and Jeroen Bosch Ziekenhuis. Procedures performed in this study were in accordance with the 1964 Helsinki Declaration and its later amendments and in accordance with the ethical standards of the institutional review board and independent ethics committee. All participants gave written informed consent prior to enrolment and randomisation. The authors have full control of all primary data and agree to allow the journal to review their data if requested. Nangia J, Wang T, Osborne C, Niravath P, Otte K, Papish S, Holmes F, Abraham J, Lacouture M, Courtright J, Paxman R, Rude M, Hilsenbeck S, Osborne CK, Rimawi M (2017) Effect of a scalp cooling device on alopecia in women undergoing chemotherapy for breast cancer: the SCALP randomized clinical trial. JAMA 317:596–605. https://doi.org/10.1001/jama.2016.20939 [doi]. 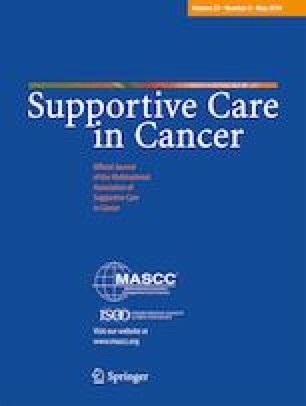 Ross M, Fischer-Cartlidge E (2017) Scalp cooling: a literature review of efficacy, safety, and tolerability for chemotherapy-induced alopecia. Clin J Oncol Nurs 21:226–233. https://doi.org/10.1188/17.CJON.226-233 [doi].